New Orleans You find some dangerous things going along the side road on the way by Susie’s house, but I’m going to take you there with me to see some scary rip-offs of everyone, but especially soldiers and other members of the armed forces. There was a report on the top ten financial institutions that make their money as a percentage of deposits from various banking fees like converting overdrafts to short term loans and the like. Keep in mind that overdrafts are always big business for banks who scooped in $32 billion in 2013 along on fees for bouncing checks. The drift of the storyline of the Wall Street Journal’s review of federal filings of banks was that five of the top ten banks reporting the highest level of bank fees as a percentage of deposits from 2010 were housed in Walmart stores, led by Woodforest Bank. And, they were right, since obviously Walmart is aiding and abetting a ripoff of its largely low-and-moderate income customers, which I have to heartily condemn. But, they were silent on another part of the story, which was equally predatory, and directed at vulnerable soldiers, which is likely the real story here: the top ten banks making most of their money on these up to 300% interest rates on fees were almost always cheek to jowl with military installations and directly, if not solely, catered to the military. Of the top ten, likely nine of the banks were designed to cash in on their proximity to military bases and the soldier’s syndrome of long months and short money. So, yes, Fort Sill National bank, has a lot of stores in Walmarts and so does City National Bank and Trust Company, but both are headquartered in Lawton, Oklahoma, the home of Fort Sill. 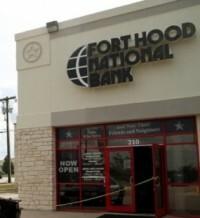 First Convenience Bank is also one of the top ten on fee income and is number two in Walmart locations, but it joins Fort Hood National Bank in the number nine position on the list as both being headquartered in Killeen, Texas, which of course is the home base of Fort Hood. Number seven and number ten on the list are lighter on doing business at Walmarts, but calling themselves the Armed Forces Bank of California located near all of the naval bases in San Diego and the Armed Forces Bank headquartered in Fort Leavenworth, Kansas, says it all doesn’t it? Nor do I have much doubt about the militarily oriented predatory business model of Academy Bank headquartered in Colorado Springs, undoubtedly named in honor of the nearby Air Force Academy. So, yes, perhaps Sunbank in Phoenix is just a small outfit with a huge amount of its money coming from fees, but I would bet money a map search puts them near the gates of Luke Air Force base. Just as I would not be surprised at this point if Southern Commerce Bank in Tampa isn’t right up against MacDill Air Force base or the other military outfits from naval to boots on the ground in Tampa. So, yes, Woodforest National Bank, based in the upscale Woodlands suburb of Houston is a bloodsucker for the Walmart crowd with branches in over 700 Walmarts, but the rest are putting dollar sign targets on the backs of uniformed military around the country and ripping them off right and left. We have a Military Lending Act passed several years ago which was supposed to protect military from predatory loans, but both the top brass and Defense Department, Walmart, and Congress is allowing predatory financial institutions like these banks and others to deliberately, and almost exclusively, target military and military institutions to reap their ill-gotten gains. How can Congress or the Consumer Financial Protection Bureau allow this? This is when we have to wish Elizabeth Warren was a Senator in her birth state of Oklahoma or in Texas where she lived and taught so long, and not Massachusetts, but surely there are plenty of elected officials willing to stand up for the rank and file military against the banks? Or, am I kidding myself again? This entry was posted in Citizen Wealth, Financial Justice and tagged banking, banks preying on soldiers, Fort Hood National Bank, predatory banking, Wall Street Journal, Walmart Stores, Woodforest Bank by Wade. Bookmark the permalink.